This page discusses modelling mechanics associated with how to treat cash flow that comes from changes in the debt service reserve account (the DSRA) in a financial model when computing debt repayment. If cash flow from changes in the DSRA account is positive, meaning that the DSRA is reduced through withdrawals from the bank account, then some would argue that this cash flow should be included in calculation of the DSCR. After all, it is cash that is available to pay debt service. Similarly, if the DSRA account is required to be increased and you must deposit cash into the DSRA bank account, one could argue that CFADS should be reduced. Including deposits or withdrawals from the DSRA in the calculation of repayments with sculpting and the DSCR is not easy. It can can cause painful circular reference issues. With some mathematics and VBA you can solve the DSRA moves and DSCR calculation, but it is not easy. Many years ago I had a very smart student who explained that in a PPP project with a tight debt service coverage, including changes in the DSRA in the DSCR can be an important issue in financial models. I became obsessed with this for years. When trying a copy and paste macro or a UDF, the process blew up. Later, another person told me that the DSRA balance should be used to pay debt service in the final year. This is a variation of the same issue. The last period change in DSRA is the repayment of the DSRA and this change can be included in sculpting. Developing a project finance model that can evaluate the effects of including DSRA deposits and releases included in the DSCR are discussed below. Videos and files on this page describe how to resolve this problem with a UDF and some NPV formulas. The project finance structuring analysis below addresses incorporation of DSRA cash changes in debt sizing analysis. If you really want to see how all of debt sculpting in project finance works you can torture yourself by working through the project finance debt sculpting videos and then trying the debt sculpting exercises. There are a couple of key files where I put the financial formulas, modelling examples and the VBA code for cases where you run into circular references. You can file these file on the google drive in the Project Finance Section under exercises and then Section D for the Sculpting course. The first file is the sculpting file that includes a separate section that isolates on the issue of DSRA changes. The second file is a model with the comprehensive parallel UDF. Perhaps the ultimate complex issue in project finance modelling is including changes in the DSRA account in CFADS and in the sizing of debt. This issue can be relatively minor but it demonstrates a lot of programming and theoretical points. So lets first discuss the theory. If you are modelling MRA accounts, most would say that changes in the MRA should be included as CFADS. This smooths out the CFADS to account for capital expenditures for things like re-surfacing of a road. You can then say why not do the same with changes in cash associated with the DSRA account. As the DSRA account will eventually be extinguished, including the changes in DSRA account will increase cash flow and allow for more debt. It will thus make the DSRA a less painful item. The above discussion is arguably all wrong. When you think about the DSRA you could think about the corporate concept of net debt and specifically the notion that cash is tantamount to negative debt. For example, when computing the LLCR as the present value of cash flow divided by debt, you should subtract the DSRA from debt and not add the DSRA to the present value of cash flow in the numerator. This is consistent with the idea that cash on the balance sheet (and that is dedicated to debt repayment) can be called negative debt. The same idea should be applied to computing the DSCR. Instead of adding DSRA cash to the CFADS, the DSRA cash should be deducted from debt service. This will increase the effect of the DSRA changes. The same can be applied to the MRA cash. Maybe the best way to think about this is the large reduction in the DSRA that occurs at the end of the debt term. This money that is received from the DSRA should reduce the debt service on a one-for-one basis. If the change in the DSRA is deducted from the denominator, this happens. If the DSRA change is in the numerator, the debt service is reduced only in part. The key for incorporating changes in the DSRA account into sculpting is to split the problem into two parts. First, you evaluate the sculpting formulas as if there were no movements in the DSRA as normal. Second you make an adjustment to the debt size (to increase the debt size) because of added cash flow that comes from the DSRA releases. Second, the repayment is reduced by the DSRA moves (it could be increased if the size of the DSRA is increased). There are two ways the DSRA could apply are to treat the cash flow like operating cash flow (Case 1) or to treat the cash flow as a reduction in debt service (Case 2). For each of the cases the, the method for computing repayments in the case where the DSCR drives the debt size and the method where the debt size is given and the debt is sculpted. This method is illustrated in the simple example below where the interest rate is zero and the moves in the DSRA are only for releasing the DSRA at the end of the debt term. In the example below, note that the 100 of DSRA is divided by the DSCR of 1.5 to arrive at the amount for sculpting. The screenshot below demonstrates how different methods could be presented in the cash flow statement. 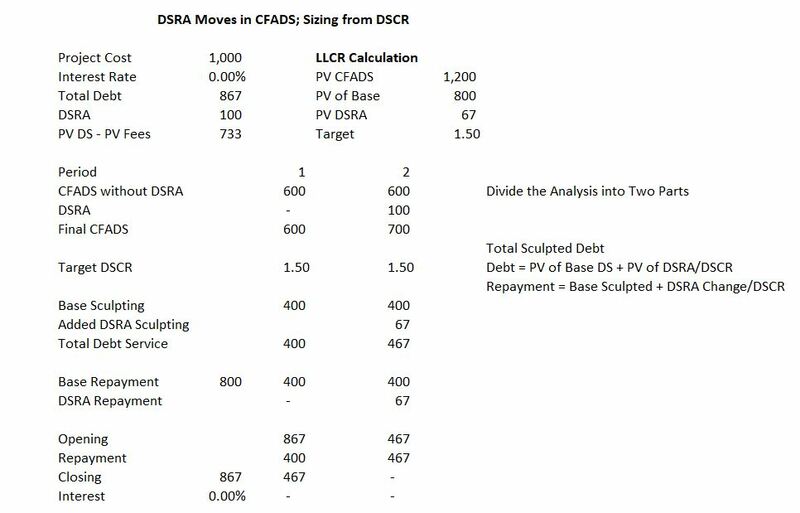 For the method where DSRA moves are ignored in computing the DSCR and evaluating sculpting, the DSRA changes are shown at the bottom of the cash flow statement. In the case where DSRA changes are treated like other cash flows, the DSRA changes are part of CFADS. In this case a reduction in the DSRA account is treated as positive cash flow for purposes of computing the DSCR and sculpting. In the final year the cash flow is much higher and the debt service requirement may be negative. 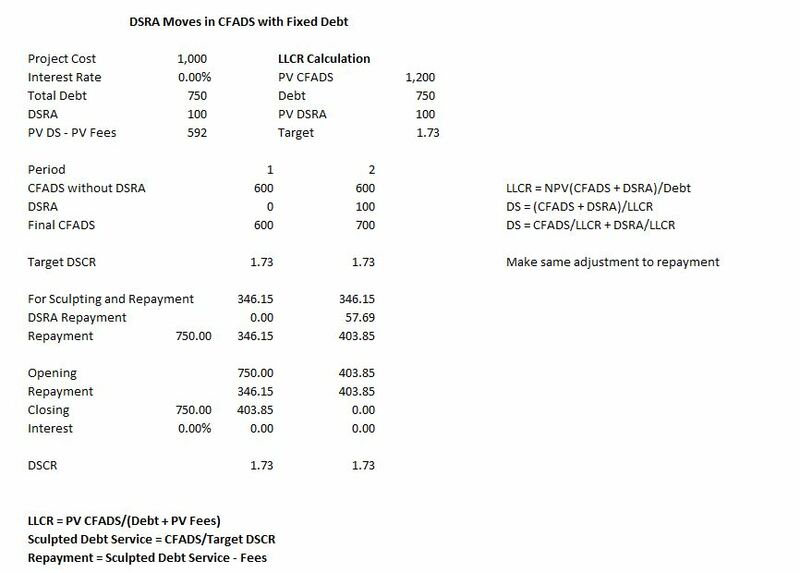 For the third case where the changes in DSRA are treated like negative cash flow using the concept of net debt, the DSRA changes in the debt service section of the cash flow. The DSRA balance comes from debt service. With sculpting and changes in the DSRA included in CFADS, the size of the DSRA is driven by the debt service but the debt service comes from the DSRA. This idea does not make sense and the change in DSRA that is part of debt service should not be included in the DSRA itself. Consider a simple example. You need liquidity for a trip — some cash in case things can go wrong. After the trip, you will not need the cash. You need to decide how much liquidity you will need from your fixed costs. At the end of the trip you can subtract the money you have in the bank for liquidity from the fixed costs. The liquidity is the DSRA and the fixed cost is the debt service. Assume your fixed cost is 100 for three months — a long trip. Assume you need to put aside 100 for the trip. If the liquidity requirement is reduced for the last period, then the fixed cost is reduced to zero and you don’t need the liquidity anymore. This does not make sense. The fixed costs still exist and the liquidity account must not be distorted by changes in the account itself.